Pilot Uniform Piece that includes left chest grommet holes for wing placement. 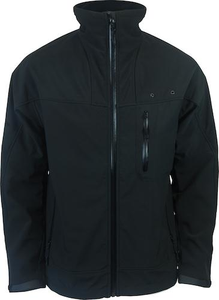 Fashioned from innovative windproof, 4-way stretch fabric for ease of movement, this jacket combines the protection and abrasion resistance of a shell with the warmth and wearing comfort of fleece. An inside water repellant breathable membrane keeps you comfortable and dry in foggy, chilly and windy weather. This unique softshell jacket also breathes, so you won’t work up a sweat while working at your job. Water repellant zippers throughout, a streamlined adjustable hem, wrist cuffs to seal out the cold, and plenty of pockets for comfort and convenience. NOTE: Please see image of sizing chart. This chart is a sizing guideline only.